Pickled green beans are also called as dilly beans. They have a great crunch and addictive flavor. They can be served plain or enjoyed in all sorts of meals like toppers for baked chicken, steak, salads, pastas, and burgers. There are also many green bean varieties that you can choose from and each one has a unique flavor and texture. Pickled green beans are often packed with other vegetables and herbs, especially dill seeds or sprigs for the common "dilly beans". They may also include other ingredients such as red peppers, garlic cloves, and even Tabasco sauce for an added kick. Pickled green beans are great for the digestive system and provide steep amounts of vitamins, minerals and enzymes that the body needs. 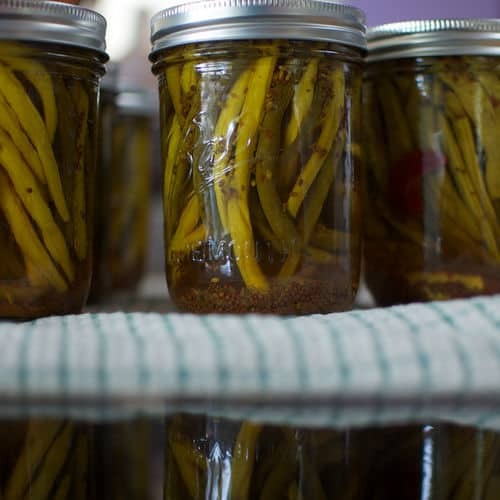 Pickling green beans uses a similar process as pickling cucumbers. Prepare the green beans by removing the tips and throwing away any damaged or discolored beans. Rinse them thoroughly in cold water to remove dirt and sand then drain in a colander. Prepare any additional ingredients you will be adding such as onion, peppers, or garlic. Add all the ingredients into jars. 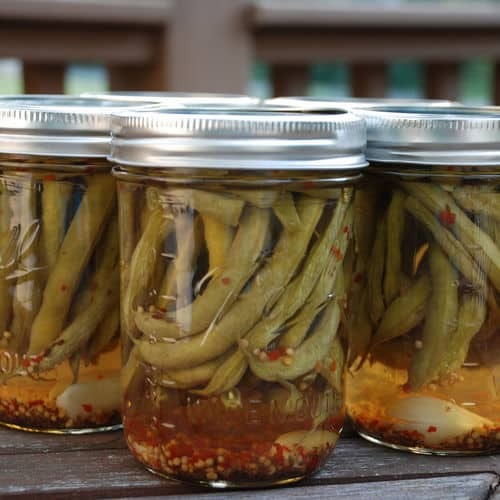 Remove the pickling solution from the heat and pour it into the jars filled with green beans. Leave about 1/2" at the top of the jar. Seal the jars. If you are canning the green beans you now process the jars in a water bath for 15 to 30 minutes, depending on the size of the jars. Once the jars are processed they can be stored in the cabinet for up to a year.